Cher Foth, a native Kansan, has a B.S.B.A. 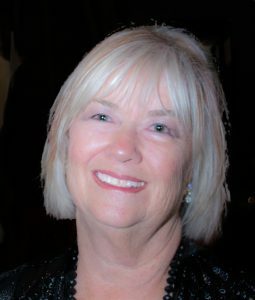 from Auburn University and is a member of the American Association of University Women and the Florida Writers Association. Living and traveling throughout the world, she has absorbed the rhythm and color from these exotic places, translating them into the texture and voice of her novels. She resides with her husband in Florida, playing tennis and enjoying her granddaughters and cranky senior cats, Lucy and Cuda. Morning coffee – the hotter, the better. Also If I’ve been writing in my sleep, which I do often, those nighttime ideas are screaming for me to quickly get them down on paper before they disappear. I outline my books with a definite beginning, middle, and end – filling in the details as the writing progresses. I usually begin writing, coffee mug in hand, in early morning. My head is clear and not bothered by the mundane activities of the household as yet. Sometimes I will write all day when the Muse is with me. It’s an emotional thing, you see. Absolutely. They are as real to me as any flesh and blood human. I never talk to them, just listen. Don’t ever think it will be a slam-dunk. A few are lucky, but most of us have to slave in the trenches. The art of writing is such a delicate spirit that, like a baby bird in hand, can be crushed so easily. You must be deliberate, patient, and willing to edit your work constantly, with no regrets of elimination. Set up an amazing blog and website, then just do it! Indie publishing was the most expedient method. Lots of work on my part, but you don’t get that much help from publishers in this day and age. The era of Maxwell Perkins holding the hands of Hemingway and F.Scott Fitzgerald are long gone. Where the money points, that’s where it will follow. I think, due to costs, there will be more books published on line than in print. It will become harder to get on Amazon as they will be much more selective.